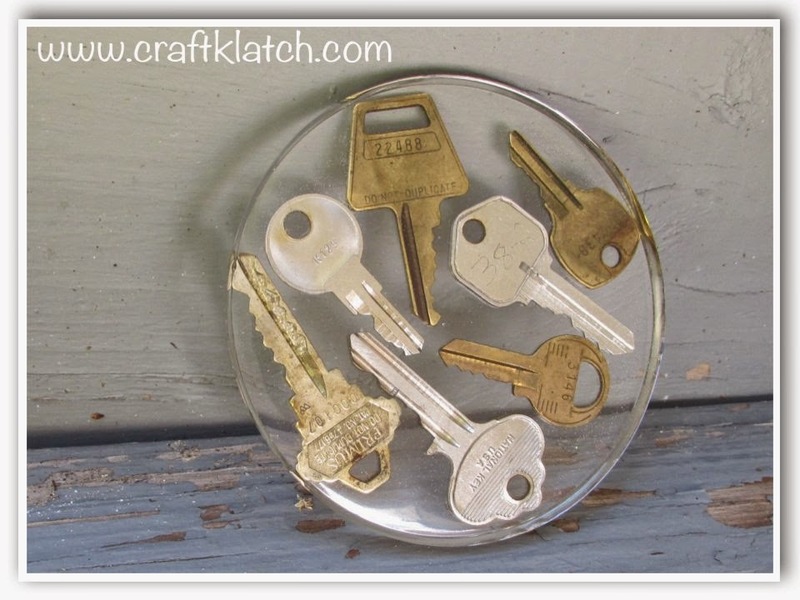 Craft Klatch ®: Keys Coaster - Another Coaster Friday DIY with Garage Sale Finds! Keys Coaster - Another Coaster Friday DIY with Garage Sale Finds! As many of you know, especially if you follow me on Instagram or Facebook, I did a big garage sale day a few weeks ago. Meaning I went to garage sales, I didn't have one. I bought chairs, an ottoman, bunches of buttons, tables, fake pearls and keys. There were two lamps, another chair and a fireplace screen on the side of the road too. Oh! And a garden settee that was on the side of the road. I have plans for most of it. I'm on the fence about a few things. Today I'm using some of the keys. It was an estate sale and it was hoarderville. I bought a bunch of keys and the guy looked at me like I was crazy. I might be crazy, but I prefer to think Crazy Crafty!! Everything that came from that house was filthy and stinky. I bought buttons, fake pearls (I think they are fake, but I'm not sure how to tell) and a large amount of buttons. Armed with rubber gloves, I put all of it into a container with hot water and Dawn dish soap. I let it soak and the water turned gray. I dumped the water and did it again. The water turned gray. I did it again and the water turned just was gray as the first time. I did that several times, letting it soak each time. There was a stink to it too that wouldn't let up. Finally, I took out the pearls and washed them separately, a couple more times. I put the buttons and the keys back in the container with hot water, Dawn and bleach. It took a couple times and days of soaking before things took a turn for the better. I didn't scrub the keys or do anything to get rid of the patina. I just had to get rid of the smell. 1. Prepare your resin according to the package directions. 2. Pour a small amount into the mold - just enough to cover the bottom. 3. Take each key and dip into the resin - this helps remove bubbles. 4. Put them into the resin that is in the mold. 5. Add the remaining resin. 6. Take your lighter and run it across the resin to remove any bubbles. 7. Allow to cure a minimum of 12 hours before unmolding - remember it takes 72 hours for a full cure! That's it! Thanks for stopping by and Happy Crafting! How to tell fake pearls from real pearls is super simple. Scratch them on your teeth. If they are gritty, then they are real. If they are smooth, then they are fake. Shouldn't hurt the pearl, especially if real. If fake and really old, it might take a little of the "paint" off. Hope that helps. Just found your site and having fun looking at all your great ideas. DIY: How to Make an Easy Cat Toy!